An international team led by Sydney University astronomer Professor Peter Tuthill has announced the discovery of a new member in the pantheon of exotically beautiful celestial objects. 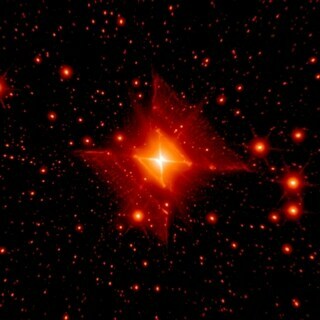 Images of the bipolar nebula christened "The Red Square" show startlingly symmetrical and complex details of form. An articleannouncing the findappears in the most recent issue of the journalScience, co-authored by Professor Tuthill and James Lloyd of Cornell University. "Discoveries as beautiful - and interesting - as this one don't come around very often in astronomy," said Tuthill, "and it took some of the world's most advanced telescopes, together with a good dose of luck, to find this jewel hidden among the myriad stars in the galaxy. "The key to finding it was in the revolutionary new imaging technology of Adaptive Optics, which acts like a myopia cure for a telescope," agreed Lloyd. "Startlingly clear images capable of revealing objects like this are now possible without the blurring." The pair was studying a hot star called MWC 922 in the constellation Serpens (the serpent mythologically associated with the origin of medicine). Their images combine data from the Mt Palomar Hale telescope and the Keck-2 telescope taken in near-infrared light (1.6 microns), and show a region 30.8 arcseconds on a side around MWC 922. As the outer periphery of the nebula is very faint compared to the core, the image has been processed and sharpened to display the full panoply of detail and structure.